St. Louis Federal Reserve President James Bullard on the economy, the outlook for a potential interest rate hike and the changes to the Fed proposed in Congress. 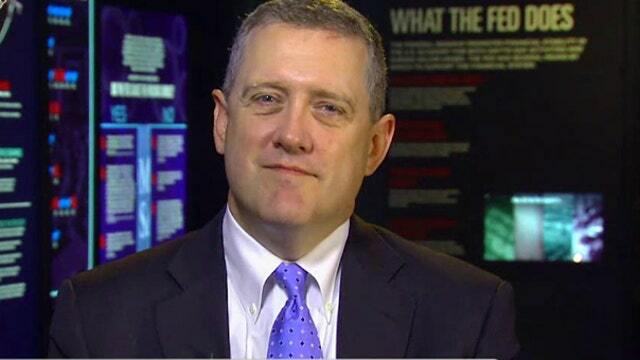 Bullard made those comments during an exclusive interview with FOX Business Network&apos;s Peter Barnes on Mornings With Maria. With the economy back on track, Bullard predicts a rate hike in September has "more than a 50% probability right now.” He downplayed the idea of a rate hike happening any sooner. The Federal Reserve will issue a statement at the conclusion of its next meeting on Wednesday July 29. Policymakers, including Bullard, continue to say they are "data dependent" when assessing the case for higher interest rates. The job market is one area that is improving. In June, U.S. employers added 223,000 workers and the unemployment rate dipped to 5.3%. The one laggard is wages -- average hourly earnings for all employees remained unchanged at $24.95.